Felting your knit or crochet project is a great way to create a soft, dense fabric from wool yarn. Most people prefer felting in the washing machine, but not everyone has that option. The great news is that you can felt by hand, using your sink, a bucket, a washtub, or even the bathtub. Depending on the size of the project, felting by hand can still be quick and easy. Felting a knitted or crocheted swatch before finishing the full garment is the best way to make sure the fabric felts the way you intend. Also, keep in mind that felting will shrink the fabric, so follow your pattern's instructions regarding size before and after felting very carefully. For the purposes of this demonstration, a 4-inch wide and 5 1/4-inch tall swatch was knit with Caron Felt-It, a now discontinued wool yarn. Felting will not work unless you use a 100 percent wool yarn, so be sure to read the yarn label carefully. After you've made your sample swatch it's time to get the felting started! All you need is some hot water and some agitation (which is you). For small projects like a swatch, you can easily felt in a clean sink. If you have a bigger project, you might want to use a bucket or wash basin. You can also use a bathtub, though it requires a lot of water. Fill your receptacle of choice with enough hot water to comfortably cover your soon-to-be-felted item as you swish it around. Don't fill it so much that you'll splash the whole room with water. Add a few drops of dishwashing liquid (not laundry soap) to help open up the fibers and make your piece more receptive to felting. Use your hand or a stick to swish the piece around in the water. Use your knuckles for added oomph, and rub the piece along the bottom of the sink to get a little more agitation action. Wearing rubber gloves not only protects your hands while you do this, but it can also add an extra bit of roughness. Gloves with slightly textured palms are the most helpful. After a couple of minutes of swishing and flipping your swatch, pull it out. Gently press out some of the water. Spread it on a towel and examine your progress. This picture was taken after about five minutes. The swatch laid out flat in that time and was already beginning to get fuzzy. In this amount of time, the height shrank to about 4 1/2 inches, while the width stayed about the same as the original swatch. If you're not seeing much felting progress, shock it with a cold water rinse before returning it to the hot water. This seems to help the fibers come together a little more easily. Remember that every yarn—even different colors of the same yarn—can felt differently. 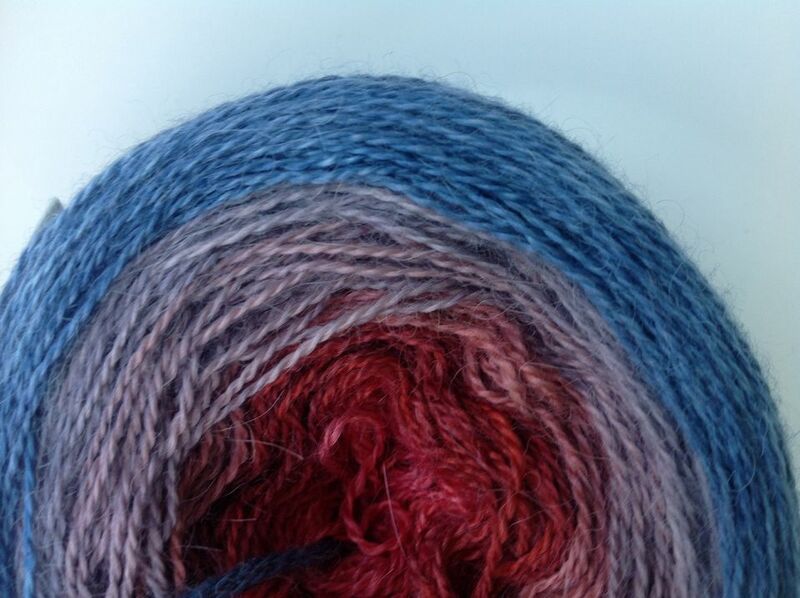 Have patience if your yarn isn't felting immediately. One of the hardest parts of felting is knowing when to quit. The answer is really a personal choice. Things can be felted gently so that the stitch definition has just started to go but the piece looks solid. Or, they can be felted quite harshly, where all semblance of individual stitches is completely gone. Naturally, it takes much longer to completely erase the individual stitches when you're felting by hand. For this reason, you may not want to take the felting as far as you might if you were using a washing machine. One great thing about felting by hand, however, is that it is very easy to check your work so you can stop exactly when you want. It is also a great choice when you're trying to get to a specific dimension. 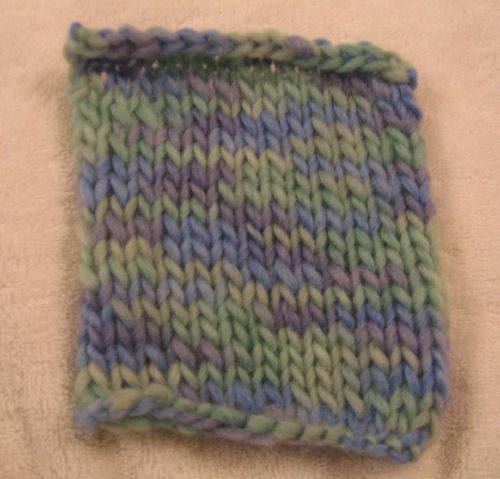 The example swatch was considered done when it measured about 3 3/4 inches square. Most of the stitch definition is gone, though you can still see the stitches right on the edges, and the swatch has become quite fuzzy. Once the felting process is complete, there's one more step you need to do in order to make your felted project come out right: blocking. Blocking helps make your finished project the shape that you want it to be. In the case of this swatch, that's a square. If you were felting a bag or another large project, you might block it by stuffing it with newspapers until it is the shape you want, then allow it to dry. Blocking a swatch is much simpler. Simply pin down one corner, then stretch gently until the sides are square and pin down the opposite corner. Repeat with the other two corners and pin down the sides if necessary. Allow your swatch to dry and celebrate successfully felting without a machine!